Don’t need no master, I am not your man! I’m gettin’ all set to go on a ram-page! You earn yourself money by puttin’ me in jail! ‘Cause I’m nothin’ to you. You think I’m an animal, not even a man! 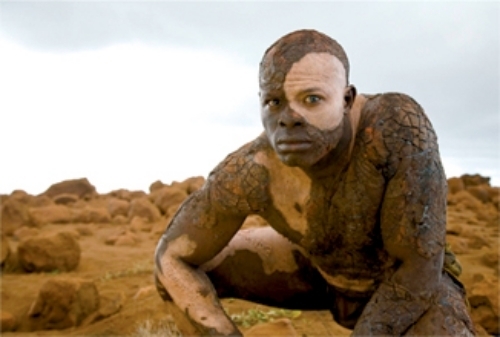 Djimon Hounsou plays Caliban in the wonderful 2010 movie of The Tempest, starring Helen Mirren as Prospero. Felix is just too busy to notice. He has his head buried in his work, directing plays at the Makeshiweg Theatre. He has been doing it so long, with such success, that in theater circles, he is in fact a bit of a legend. While he works, others plot. He is caught in the clouds of his own dreams. Well, until two large men from security appear, flanking his arch-nemesis (An)toni(o). Felix is frogged marched out to the alley, with a laughably small severance check and a few bags of belongings which are stuffed into his car by Burly #1 and Burly #2. Just like that, he is deposed, usurped, overthrown, dethroned. Felix decides that he needs to escape the city. Everything about the city just reminds him of the theater and his past glories. He finds a shack in the country, a hovel really, a cell. He tries to read all those Russian classics he always meant to read, but finds himself instead reading children books to his daughter Miranda. Felix broods. He ponders. He grieves for his lost magic. He plots elaborate revenge scenarios. One thing he has learned from Shakespeare about revenge is that it is best served cold. Get to know thy enemy. After many years of self-imposed exile Felix decides to apply for a job at a correctional facility teaching a literature course. He is, of course, grossly over qualified, but with a wink and a nudge at the Interviewer who recognized him, he was able to take the job under the name F. Duke. His nod to Prospero who was the deposed Duke of Milan. He hoped to make his return from exile be Prospero’s escape, as well, from the dusty corners of Felix’s past frustrations. His plans to make The Tempest cut short by his enemies can now finally be realized. He throws out the curriculum at the correctional facility class and makes it all about Shakespeare. Doomed to failure right? How can mostly uneducated, criminal minds get into Shakespeare? Remember the pit at The Globe where the unwashed, the dregs, the petty criminals, and prostitutes filled the theater to capacity to watch Shakespeare’s plays? They were there to get away from their own lives for a couple of hours, but also to revel in the sword fights, the treachery, the intrigue, the ghosts, the magic, the star crossed love affairs, and the madness. Maybe they didn’t always catch all the higher ideal references that are sprinkled liberally among the tombstones, blood spilling, and flying spirits of Shakespeare’s plays, but the level of success Shake and Bake enjoyed attests to the fact that the mob as well as royalty and gentry enjoyed his productions. 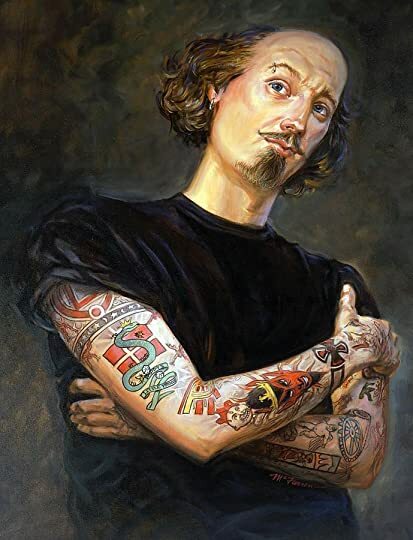 Yo, Shakespeare, lay some words on me bro. Painting by Mathew McFarren. With such a hugely successful program the government should be excited about duplicating what Felix is doing in every prison in the country, right? Erhhhh not exactly. ”In their announcement, they’re going to call it an indulgence, a raid on the taxpayer wallet, a pandering to the liberal elites, and a reward for criminality.” I know this is Canada, but they must have stolen their talking points from the Republican party in the United States. Justice is about punishment not rehabilitation. In their minds those who have crossed swords with the law don’t deserve the help they need to be something more than just ex-cons when they step out of prison. And the politician and his cronies who is coming to visit this program and see with their own eyes the overindulgence of these miscreants, is none other than Felix’s old friend Tony. As Felix dons the coat of many stuffed animals and transforms into Prospero can he set revenge aside to save the program or will all of his work just be a springboard to destroy his enemies? 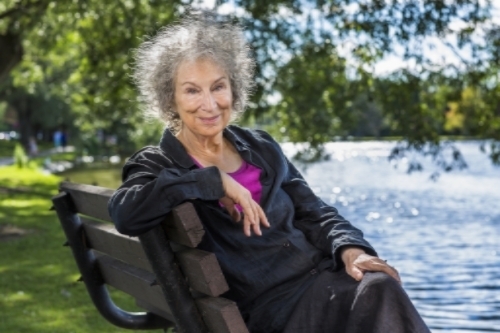 Doesn’t Margaret Atwood look capable of casting a spell or conjuring a tempest at will? This is yet another great retelling of a classic in the Hogarth Shakespeare series. I would highly recommend reading The Tempest before reading this, but if not you can read the synopsis of The Tempest in the back pages of the Hag-Seed and that will give you an idea of how wonderfully Margaret Atwood has transformed the original into a heartwarming, brilliant new story. I could not put this book down. Highly recommended! !